Things were rather quiet on the blog front last week, but never fear - posting schedule should be back to normal now (for anyone missing their dose of raving)! Due to the busyness of the last week, reviews for Court of Dreams and The Darkening Dream are going to be pushed forwards a little, and today will be a slightly older read: as you've almost certainly guessed from the whopping great picture (and the title), Death Most Definite. 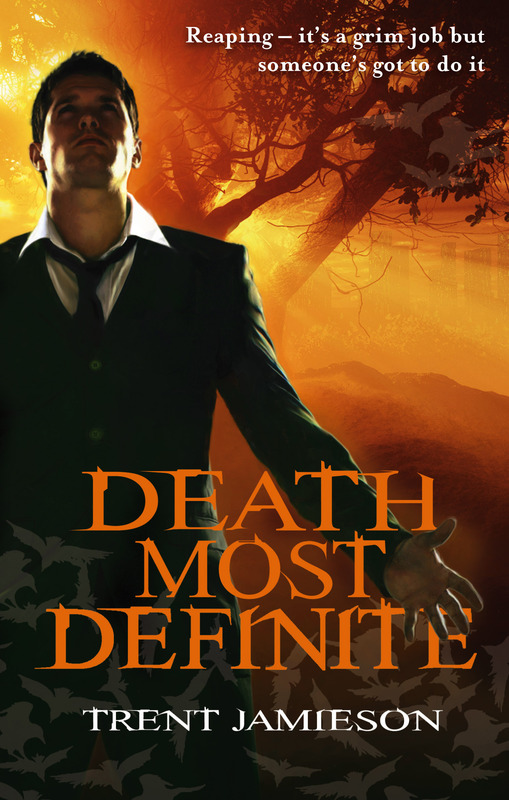 I likely expected too much from Death Most Definite, to be honest: it's been compared to The Dresden Files in the past, so I anticipated a sort of cross between Harry Dresden and Johannes Cabal, two of my favourite UF protagonists. Unfortunately, the resulting novel subverted said expectations - immensely. And besides, she's dead. Which makes it just a tad disturbing in context. I was also a tad underwhelmed by the psychopomps' abilities. In urban fantasy, the expectation is that the supernatural will be toned down from - say - epic fantasy, and there will be more combination of magic and technology. It's part of what I enjoy about a subgenre I rarely used to read. In Death Most Definite, on the other hand, the abilities weren't so much subtle as disappointing: psychopomps can touch souls to send them into the afterlife, and can stop reanimated bodies by touching them with a pomp's blood - along with a couple of peripheral abilities. And to me, because they're always used in the same way, that got tedious fast. As the only component of the supernatural, it's underwhelming: although the environment of the afterlife I did like, as an impressively neutral, bleak end. This isn't to say that Death Most Definite was all bad - the worst that can be said is that it is bland. It's still a relatively enjoyable read. It's fast-paced, occasionally dramatic, and does have some rather nice twists. If you're into urban fantasy, this might well be worth a read, but not as a first choice. As a rainy afternoon novel, though, it's fine.